The FXR.08.A is a rectangular, flexible, NFC (Near Field Communications) antenna for use in mobile devices and other applications. The design provides a flexible NFC antenna that can be adhered to the plastic enclosure of the device for ease of installation. 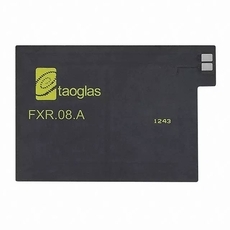 With NFC antennas being commonly attached to the battery of mobile devices, they can be customized with a ferrite flux director to provide isolation from the battery or other components within the device. Using the antenna on a conductive surface without a ferrite layer will result in extremely short range or complete failure to communicate. Customized antennas for specific applications for shape and for impedance match can also be provided for an NRE and subject to MOQ. Contact your regional Taoglas sales office for more information and support on our NFC antenna range.